Before a joint session of Congress, the President announced the new Truman Doctrine, ushering in an era of intense intervention on behalf of states with liberal economic and political institutions. Truman stated “I believe that it must be the policy of the United States to support free peoples who are resisting attempted subjugation by armed minorities or by outside pressures.” The Truman Doctrine was prompted by the United Kingdom’s withdrawal from its traditional great power role in the Near East. The immediate effect of the doctrine was a massive influx of military and economic aid to Greece and Turkey. Experienced USSR players see Truman more as a deterrent than a threat. You must be careful not to engage in an Ops war when you cannot account for its location: many a USSR player has overinvested into France only to see the President wipe out all of your hard work in one fell swoop. If you draw Truman Doctrine, it’s not hard to dispose of. Just make sure that you don’t have much influence in an uncontrolled country and it’s a null event. If you have to get rid of an influence in Finland, oh well. This becomes quite problematic after Independent Reds, when it will always have at least some impact, so try to get rid of Truman as soon as you possibly can. Be thankful you drew it and not the US. 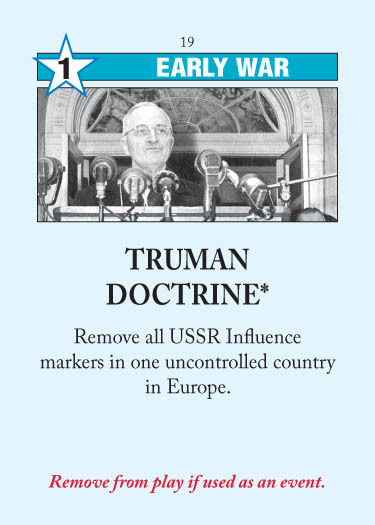 In rare circumstances where you cannot safely play Truman Doctrine, consider using Five Year Plan if you have it. If you play Five Year Plan with only Truman Doctrine in your hand, you now have 3 Ops to deal with the President instead of just 1. After drawing Truman Doctrine, the US player should try to make something happen with it instead of holding onto it for later. This is because Truman Doctrine is nigh-useless in the USSR’s hands, and Truman is one of the few ways for the US to establish initiative in the Early War. This normally means a AR7 play: break control of France, hold Truman Doctrine, and then headline it next turn. (An example of this play: Annotated Game #1, Turn 2, AR6.) It’s also possible (and much more rewarding) to pull this off against East Germany, but USSR players normally overprotect East Germany and make uncontrolling it much more difficult. If you really can’t make anything happen with Truman, hope to draw it in the Late War. Its power amplifies significantly when combined with all the other US Late War Europe events, so if you draw it with Chernobyl or Tear Down This Wall you can set off some real fireworks. You can also engage in some Turn 1 shenanigans with Truman. Against a USSR setup of 3 EGER / 3 POL / 4 FIN, place 1 influence into Finland and headline Truman to wipe out Finland. Now De-Stalinization is pretty safe to play, since he has few good countries to move influence out of, and East European Unrest actually becomes relevant. Ordinarily, though, the USSR won’t do such a rash opening setup, and in any event I prefer to hang onto Truman to try to do more damage with him elsewhere. This entry was posted in Early War, US Events and tagged truman doctrine. Bookmark the permalink. The U.S. should account for the chance that the U.S.S.R. headline either De Galle, Suez, or Socialist Goverments next turn before attempting to break control of France in AR 7 and hold Truman Doctrine. a post on the china card would be great ! Does Truman trigger if the USSR hat controlled all of its countries? I assume you mean, “Does the event get used up if there are no uncontrolled countries in Europe?” I’m not entirely sure — I think it does, but I could see it going either way. The way I interpret it (consistent with known cases), the only time an event doesn’t count as having been triggered is if there was an “If” clause at the start that wasn’t true. Truman Doctrine has no if clause, so I think it does count as having triggered (for no effect). Well because you usually will have at least one uncontrolled country with influence. For example, Finland often has some influence in it from opening setup, and Comecon or Warsaw Pact might get you some as well. As a US-Player, can I remove USSR influence from a country I control? I am not entirely sure since it states “one uncontroled country” on the card. I had this situation when he had two in West Germany and I had six. USSR played Trueman and there were not many opportunities so I thought I rather protect WG for good. Uncontrolled means controlled by neither country.